Are you facing the problem where the PRINT/SELECT statements messages are not being displayed like the one’s explained in the below two scenario’s? Let us go through these scenario’s and also see how to solve them. PROBLEM: PRINT/SELECT Statement values within a WHILE LOOP are not displayed when they are executed instead they are displayed at the end of the WHILE loop. In the above script we are going through 10 iteration and each iteration has delay of 1 second. And during each iteration we are displaying messages using PRINT and SELECT statements. Here if we observe the execution of the above script, all the PRINT/SELECT statement messages are displayed at the end of loop i.e. after 10 seconds instead of it being displayed during each iteration (i.e. when it is executed). As shown in the below image even after 8 seconds of execution of the above script not even a single message’s of the PRINT/SELECT are displayed. SOLUTION: The reason why the PRINT/SELECT Statement Messages within a batch are not displayed is because Sql Server BUFFERS the output. Below are the two way of solving this issue. 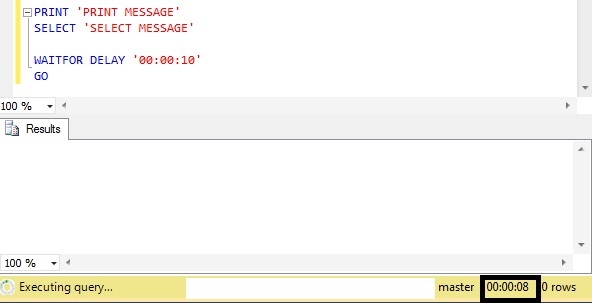 Here I am using the RAISERROR WITH NOWAIT, and severity level is 10 which is sufficient enough for the Sql Server to consider it as a message instead of it being an error. RAISERROR WITH NOWAIT statement flushes all the buffered messages. Note this works fine for the first 500 RAISERROR WITH NOWAIT statement’s only. After that SQL Server starts flushing 50 messages at a time. PROBLEM: PRINT/SELECT Statement values within a BATCH of statements are not displayed when they are executed instead they are displayed at the end of the execution of the BATCH. As shown in the below image even after 8 seconds of execution of the above script the PRINT/SELECT messages are not displayed. Both RAISERROR and THROW statements are used to raise an error in Sql Server. 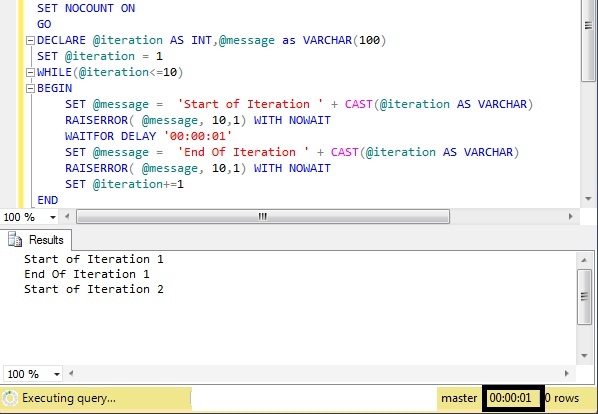 The journey of RAISERROR started from Sql Server 7.0, where as the journey of THROW statement has just began with Sql Server 2012. obviously, Microsoft suggesting us to start using THROW statement instead of RAISERROR. THROW statement seems to be simple and easy to use than RAISERROR. This is the third article in the series of articles on Exception Handling in Sql Server. Below is the complete list of articles in this series. Version of the Sql Server in which it is introduced? Introduced in SQL SERVER 7.0. And as per BOL, Microsoft is suggesting to start using THROW statement instead of RAISERROR in New Applications. RAISERROR can’t be used in the Sql Server 2014’s Natively compiled Stored Procedures. Introduced in SQL SERVER 2012. THROW statement seems to be simple and easy to use than RAISERROR. 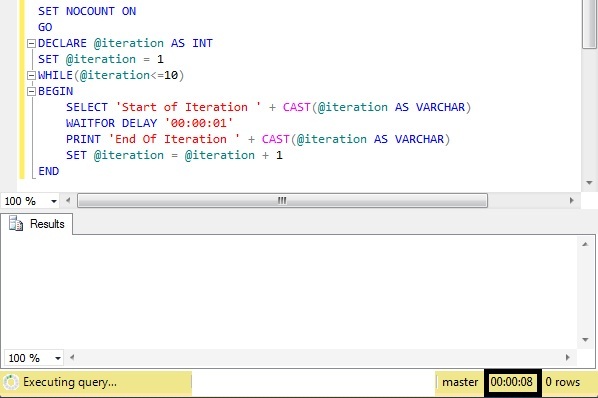 THROW statement can be used in the Sql Server 2014’s Natively Compiled Stored Procedure. Can re-throw the original exception that invoked the CATCH block? With above example it is clear that THROW statement is very simple for RE-THROWING the exception. And also it returns correct error number and line number. Causes the statement batch to be ended? Example 1: In the below Batch of statements the PRINT statement after RAISERROR statement will be executed. Example 2: In the below example all the statement’s after RAISERROR statement are executed. AFTER CATCH Example 1: In the below Batch of statements the PRINT statement after THROW statement will not executed. Example 2: In the below example no PRINT statement’s after THROW statement are executed. Requires preceding statement to end with semicolon (;) statement terminator? NO. YES. The statement before the THROW statement must be followed by the semicolon (;) statement terminator. CAN RAISE SYSTEM ERROR MESSAGE? The SYS.MESSAGES Table will have both system-defined and user-defined messages. Message IDs less than 50000 are system messages. YES. With RAISERROR we can raise the System Exception. Database ‘master’ cannot be restored. NO. With THROW we can’t raise the System Exception. But when it used in CATCH BLOCK it can Re-THROW the system exception.Example: Trying to raise system exception (i.e. exception with ErrorNumber less than 50000). CAN RAISE user-defined message with message_id greater than 50000 which is not defined in SYS.MESSAGES table? Error 60000, severity 16, state 1 was raised, but no message with that error number was found in sys.messages. If error is larger than 50000, make sure the user-defined message is added using sp_addmessage. Allows substitution parameters in the message parameter? We can solve such problems, we can prepare the message prior to the THROW statement and then pass it to throw statement as a variable. Below example illustrates this. RAISERROR WITH NOWAIT statement can also be used to flushes all the buffered PRINT/SELECT Statement Messages within a batch.